Dynon is pleased to be releasing our all new website. The site better portrays Dynon's rapidly expanding product line. The addition of the complete D100 series has more than doubled Dynon's line of affordable glass cockpits. Dynon will continue to add more information and functionality throughout 2006. 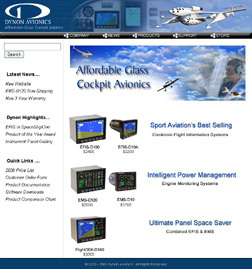 If you have any suggestions about our website, please feel free to contact us at info@dynonavionics.com.